Although it is a beautiful picture, it is unfortunately not the water buck, but a female Kudu featured on your daily photo. Definitely a highlight to any visit to a game park. Eeeek, thanks Alan! I take full responsibility – while poor Paul has been blogging ridiculously late at night, I’ve been checking his posts in the full light of day and should have picked that one up. Of course you’re 100% right. I’ll correct the post asap. Hi there, I am so glad I found your site and your wonderful pictures of Kruger Park. I have always wanted to go there but being that I am from Arizona, USA I doubt that will happen. Your photos are truly remarkable and some of my favotires were: The Giraffe with the birds sitting on his head, The close up of the Zebra’s that look like their stipes have been painted on, The Elephant with his trunk thrown over his ear:) and the Giraffee with the baby zebra. Thanks for sharing. 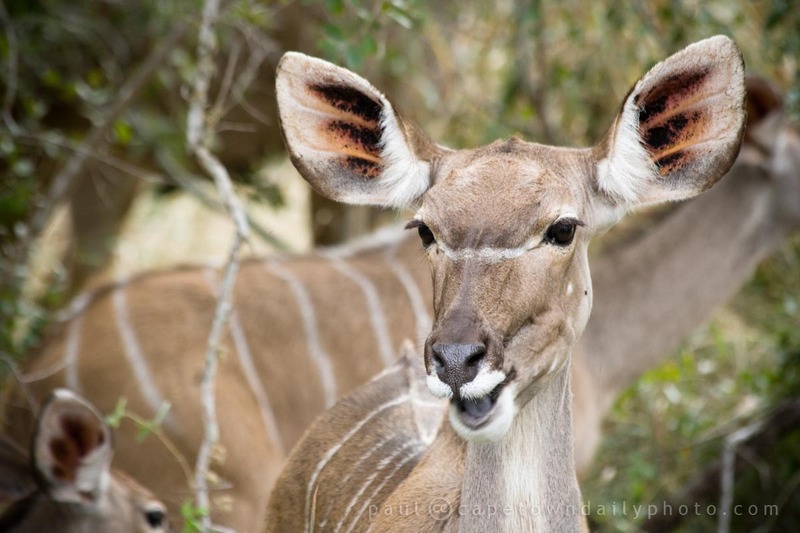 Oh I so remember seeing the Kudu and having a smile about the ears and how handy that size would be for hearing what is going on around you and of course for sussing out if danger was nearby!! Great focus on the ears..